Just a quick post, managed to finally order board for the VGA card. 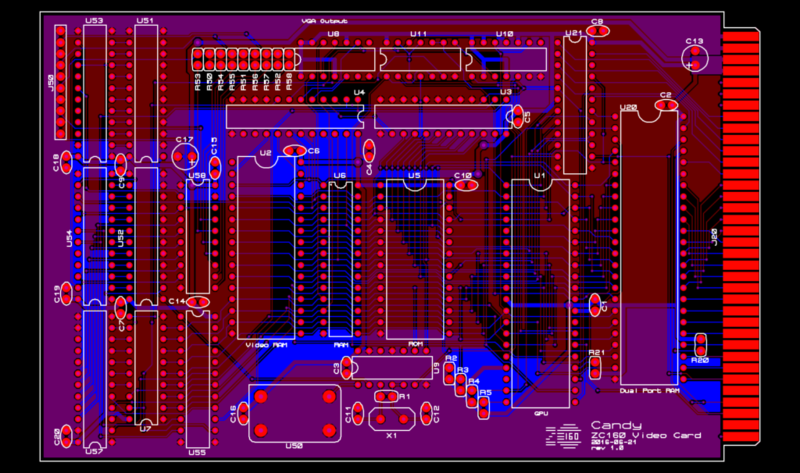 It now contains previous VGA output portion and the GPU all in one PCB. This board will definitely be the most complex one in the whole system. Well, it contains a small Z80 computer so..
Gerber output of the ZC160 VGA GPU board. I have learn a much with your “VGA adapter” page, but there is a gap to go here. Please, can you explain more about it? What GPU was used? EDIT: OK, a Z80 is used as GPU. Can you said us more about how the board work now. Hi, thanks for the interest in my project. I update this site quite rarely since my work and other hobbies take quite a lot of my time. I really should write more extensive post on how this board works. In the end it is not the simplest. Very shortly put: When pixels are drawn to display, the “GPU” (Z80) is halted using bus request (BUSREQ) signal. When VGA blanking is on, then the GPU is released to do its work. This time is about 1/4 and pixel drawing takes the rest 3/4 of the time. So the GPU and VGA signal generation circuit share the same address and data bus, no dual-port SRAM or anything like that used.